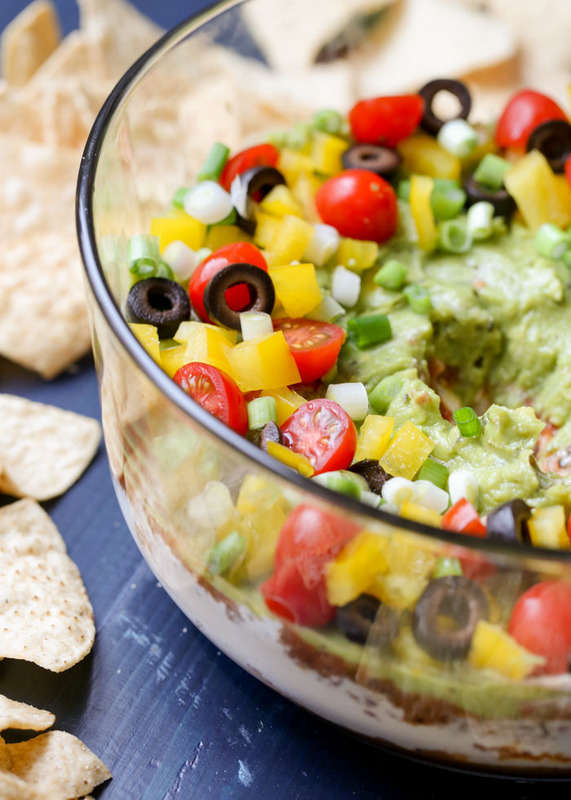 When it comes to vegan Super Bowl snacks, options can be a little scarce. But no more! 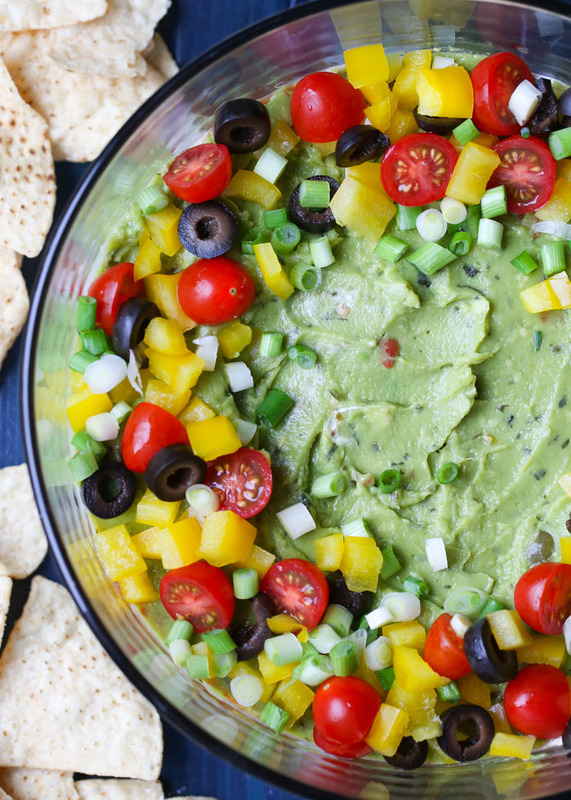 If you’re eating plant-based, this Vegan 7-Layer Bean Dip is all you need this Super Bowl Sunday. Or any day. For the rest of your life. Traditional 7-Layer Dip, the Mexican-inspired fiesta-in-a-bowl, is a wildly popular appetizer – and with good reason. It starts off with spiced refried beans, topped with sour cream, guacamole, salsa, cheese, olives, and a smattering of veggies. Cue record scratch for vegans and even vegetarians. 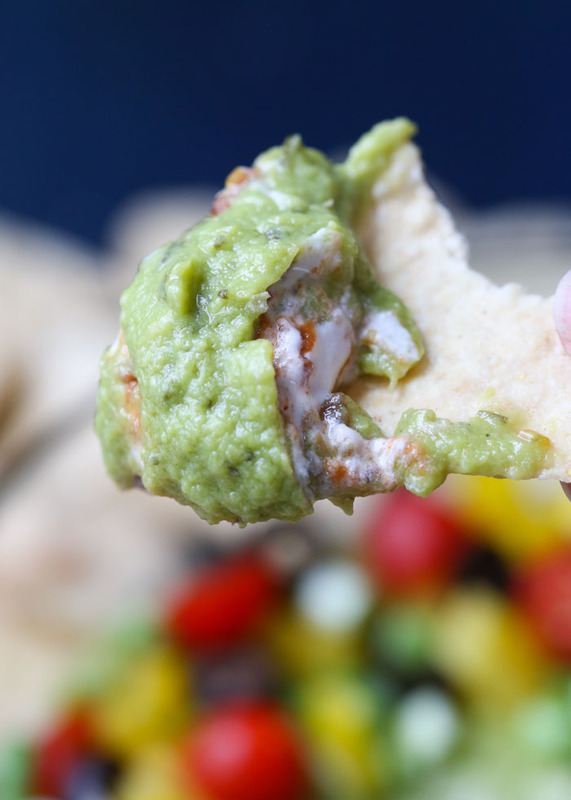 Sour cream and cheese is a no-go for plant-based folk, and even the refried beans can be a problem if they have lard in them. Soooo I set out to make a 7-Layer Dip that was just as delicious – and almost as easy – as the original. 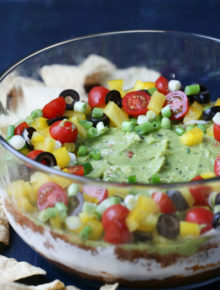 A lot of Vegan 7-Layer Dip recipes have vegan queso in the list of ingredients, and I’m sure they are absolutely delicious. But I’ve found time that for me, a nice savory cashew cream gives a dish almost everything I was getting from cheese. So I had a hunch that this dip would be absolutely delicious without adding a cheesy situation (and I really think it is). Layer 3: Salsa, baby. Salsa. 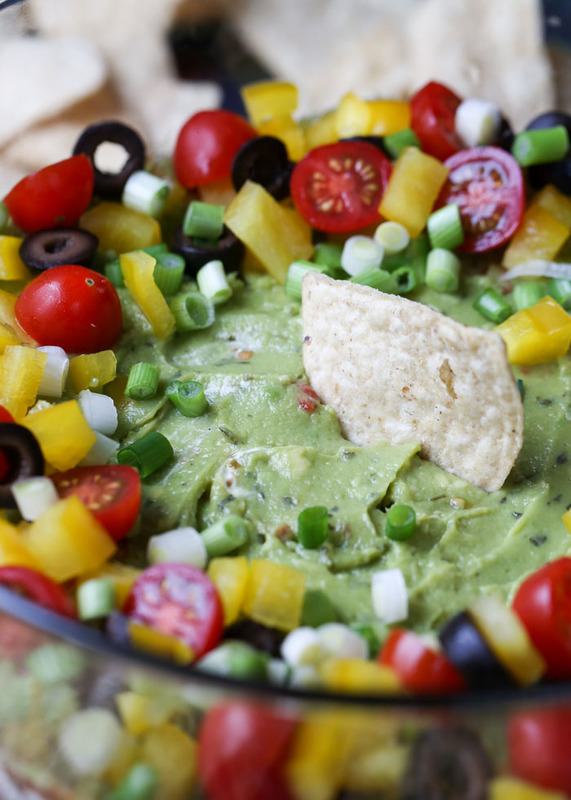 Layer 4: Guacamole – more than what most 7-Layer Dip recipes call for. Because avocado. Layer 5: Chopped yellow bell pepper. This basically stands in for the yellow color the cheddar cheese was providing to help keep it pretty, but it also adds a delightfully cool crunch to the whole situation. Layer 6: Sliced black olives. Layer 7: Halved cherry tomatoes and sliced scallions. Okay so we’re kind of looking at eight layers if we go ingredient-by-ingredients but I PROMISE your mouth won’t care. In a medium bowl, mix together the refried beans and taco seasoning. Spread evenly in serving dish. Top with sour cream and spread evenly. Top with salsa and spread the best you can. Add guacamole. Same thing – spread right to the edges. Arrange bell pepper, cherry tomatoes, olives, and green onions over the top. I like to keep them around the perimeter because I think it looks pretty that way! * Right out of the blender, your cashew sour cream might not be quite thick enough to spread in an even layer and stay that way. You can see from my pictures that I had trouble keeping nice clean layers. It still tastes delicious, but if you want those perfect layers, I suggest refrigerating your sour cream for at least a couple of hours first.